All photos by Peggy Speir. 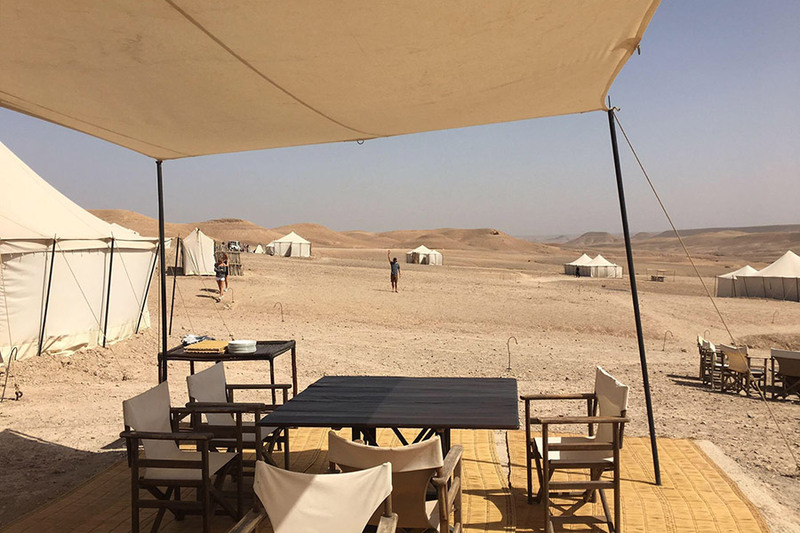 When you need a respite from the hectic pace of Marrakech’s lively medina, drive 45-minutes outside the city for a relaxing stay at a tented camp. 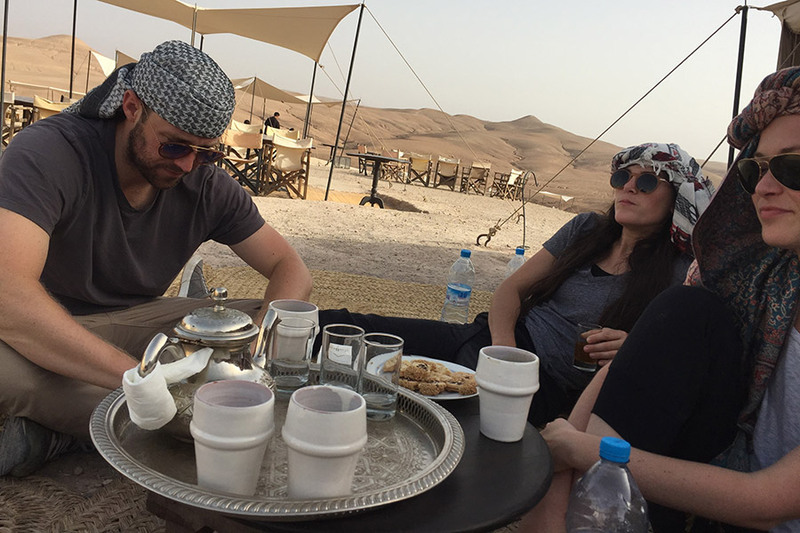 AGAFAY DESERT, Morocco – When in Marrakech, most travelers hit up the souks, visit both the old and new cities, and taste their way through tagines of all kinds. I wanted to do all that and more, which led me one hour southwest of the city to in the rocky Agafay Desert. 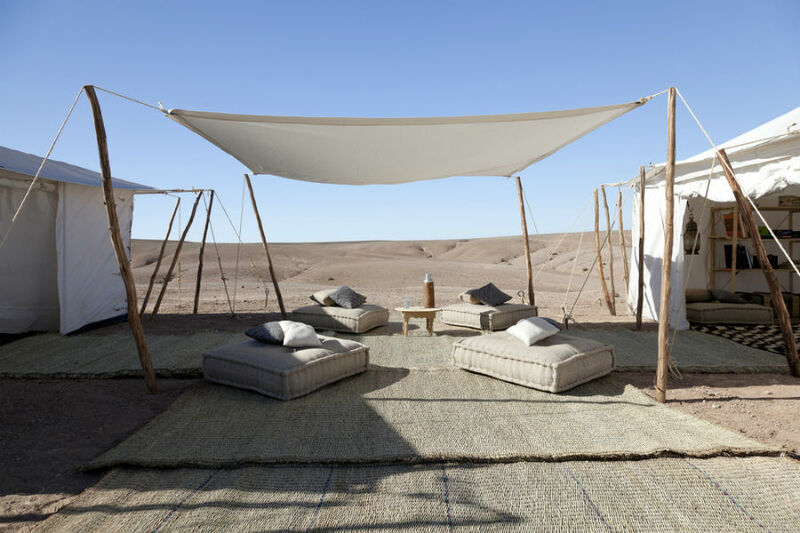 Located 22 miles from the medina, Scarabeo (or Stone Desert) is a gem of a glamping site. There are fifteen lodging tents and a few tents clustered together for socializing in the sand. I reserved a one-night stay two-and-a-half months in advance; from there I planned the meals and activities over email with the helpful and responsive staff. You can easily get there from Marrakech, but one of Scarabeo’s friendly drivers picked us up outside the city wall of coastal Essaouira. We piled in the SUV — all six of us, our luggage, and our driver — and hit the road, pit-stopping for strong coffee, passing several trees limbs weighed down by goats, and getting pulled over by police for a reason we still can't understand. Finally, we arrived at camp. After settling in, the staff welcomed us with a family-style lunch. We gathered around a big table under an open-air tent in the middle of camp and made ourselves comfortable in the director's chairs. Plates of baked and raw veggies with seasoned grains were passed, along with a lot of chilled rosé. We lounged in the shade and walked around the sand dunes taking silly photos. The camp offers many excursions, which range from daring to tame, but, for me, a trip highlight was a peaceful camel ride at dusk. In the evening, we had a group dinner the rest of the camp’s guests. We gathered around tables under candlelit tents and enjoyed a three-course meal. While we dined, a band played traditional Berber music, which quickly turned the evening into one of the best parts of our stay. After dinner, we pulled up chairs by the fire, chatted, shared drinks, and smoked hookah with other guests. Rates from $247 per night. . 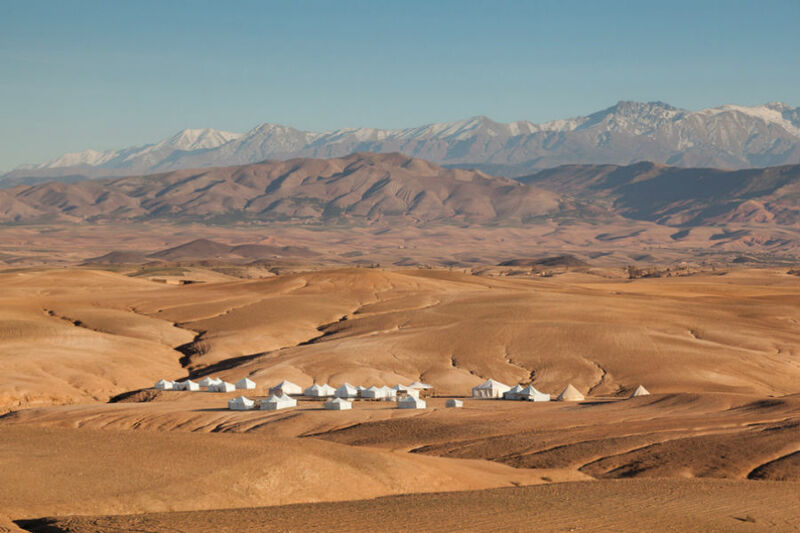 The rocky stretch of land in the Agafay Desert sits at the foothills of the Atlas Mountains. Despite taking paved roads most of the 45-minute drive, the camp feels far away and removed from civilization. Moroccan meets hipster in Africa. 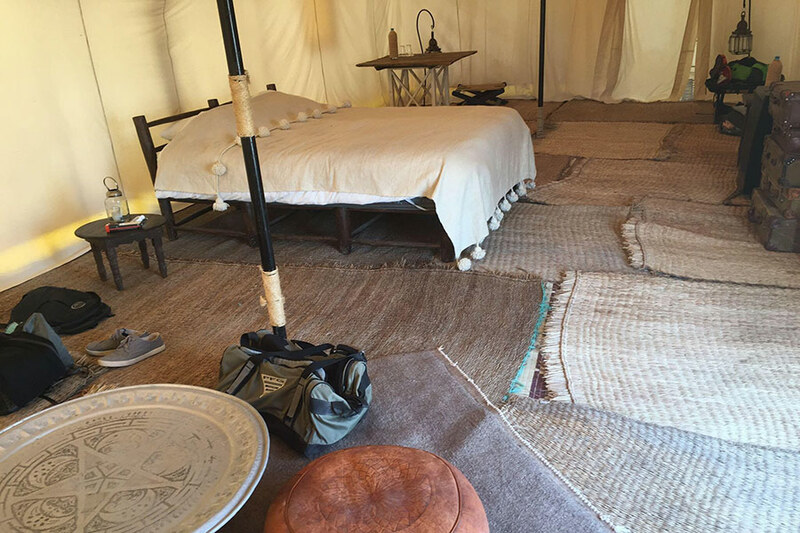 The lodging and common tents have a mostly regional flare, with lanterns, poufs, and Berber or rafia rugs. Design accents like vintage globes, maps, suitcases, books, and sophisticated leather furniture set the scene. Couples or large groups of friends looking to shake up an urban adventure. There are fifteen canvas tents spread across the campsite, including eight double suites, two twin suites, and five family suites. My cozy double suite included a bed, desk, Moroccan pouf, traditional Moroccan table, and an attached bathroom with a shower, sink, and a port-a-potty-esque toilet. The floor was covered with rugs, so I never had to walk directly on sand. The room had electricity, and all of the tents were positioned for maximum privacy. Don’t plan on having with the outside world: Cell phone reception is sparse, WiFi is non-existent, and there are no televisions. Organized activities (at an added cost) are a big part of how we spent our two days at the camp. If you’re a daredevil-type (like some of my friends), you can four-wheel around the desert dunes with a guide. 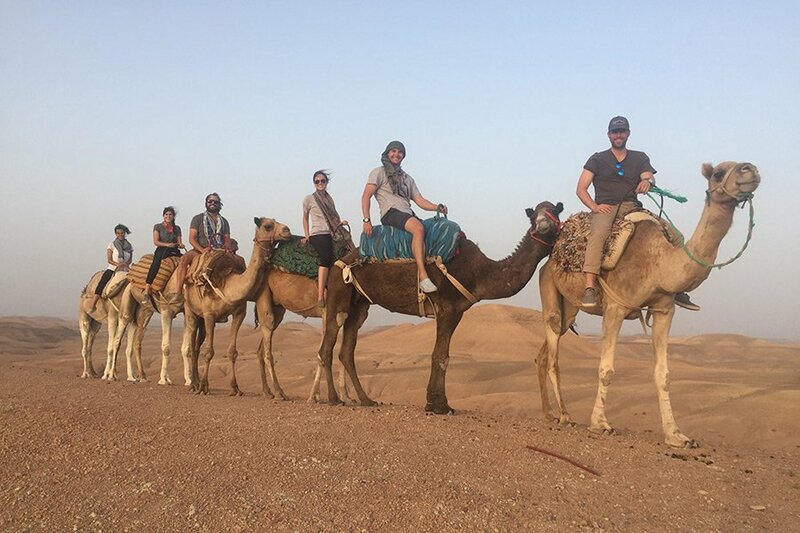 For the faint of heart (yours truly), camel riding with a guide around the camp is another option. Other excursions include star gazing, yoga classes, and donkey rides. The staff is super flexible and only needs a little notice to accommodate requests after arrival. When not doing activities, we spent a lot of time lounging in the shade, walking around the nearby dunes, and eating. The tented and open-air common areas were great for relaxing on poufs while sipping tea and wine. In the evening, we settled around an open fire with other guests to smoke hookah. Tented and open-air common areas. Photo courtesy of Scarabeo Camp. I worked with the camp staff ahead of our visit to plan the number of meals we would eat at the campsite. 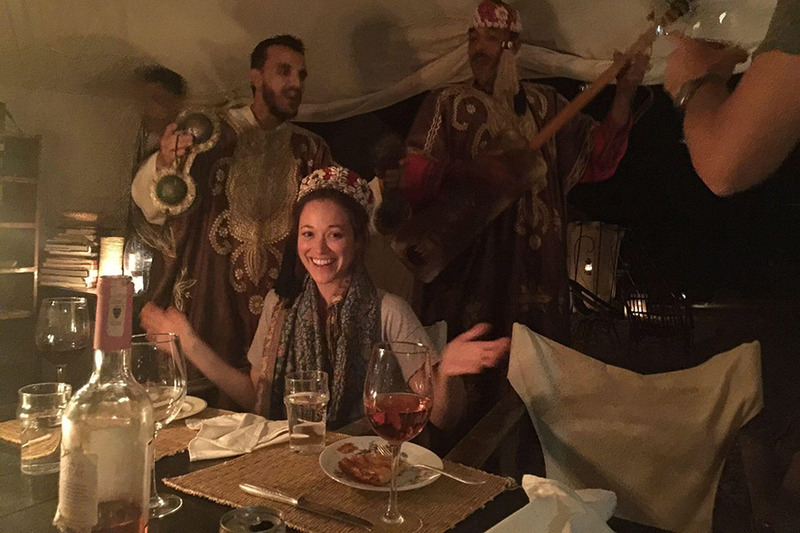 Each meal had a set menu and price, which consisted of traditional Moroccan cuisine like grilled and raw veggies, seasoned grains, and fresh-baked bread. The cost of beer and wine, which we drank a lot of — in fact, I think we may have drunk them dry — wasn’t included. Along with tips, our bar tab was taken care of at checkout. If I could do it again, I’d pack emergency granola bars and a few other snacks. While we weren’t hurting for food, it wasn’t easy to grab a quick bite without requesting it through staff. You think a camp in the desert in Morocco would be secluded, but we traveled all the way from Texas only to meet another group of Texans, one of whom was my husband's fraternity brother. Small world. The staff was incredible. Whether we needed more water (man, it was hot out there! ), decided to do a last-minute excursion, or wanted to know how to tie a scarf on our heads to beat the heat, they made sure to address our every need. Everyone spoke English (among other languages), which allowed for easy communication before and during our stay. Plus, they were fun company. If you go, please send Abdul (the best butler) all our love! Hanging out in the desert. Our rides back to Marrakech. If you need a ride, the camp staff will work with you to organize transport. We booked and paid for an SUV that fit our group of six, the driver, and our luggage. It was a tight squeeze, so if there are more than four in your group, I would recommend a second car (that is, if they can accommodate the request). 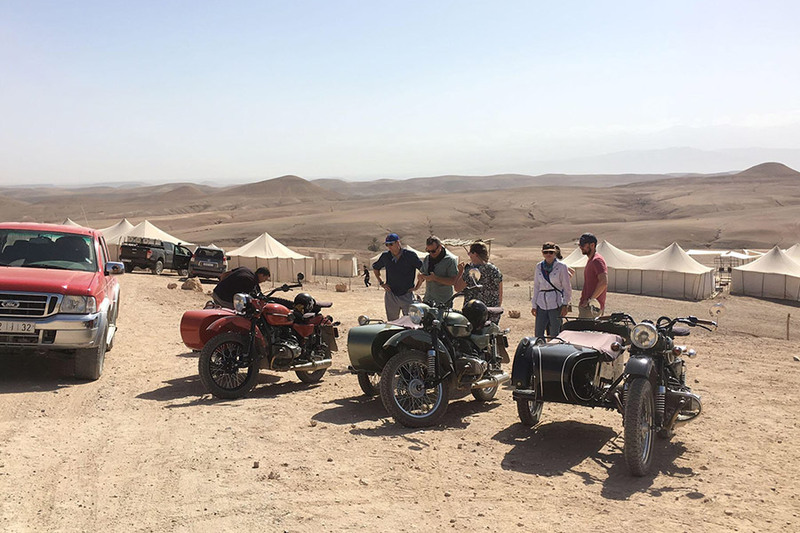 On the way back to Marrakech, the camp organized motorcyclists to come with their own bikes and sidecars to give us a ride. The guys in our group rode on the back of the bikes behind the drivers and the girls hopped in the sidecars. Our luggage followed behind in a car. It was totally safe and really fun. Riding the back roads into Marrakech was a trip highlight. Peggy is an art historian and Baltimore native living in Fort Worth, Texas. You can follow her on and . She travels for the joy of a new stamp in her passport.